All hell has broken loose in the hobby now that the Mastro shill bid list was released in Doug Allen’s court filings for his upcoming sentencing in Chicago Federal Court. The list was originally generated by the Government in its case against Bill Mastro and his shill bidding henchmen. The list includes the names of several prominent hobby figures who are identified as shill-bidders and consignors of lots that were illegally shill-bid by friends or associates. -Mastro Auctions executives Bill Mastro, Doug Allen, Mark Theotokis and William Boehme appear all over the list which includes auction sales spanning from 2007 to 2008 with a small section devoted to auctions in 2002. In the course of the FBI investigation of Mastro it was revealed that the auction company had destroyed previous bidding records before 2007. -Dan Knoll, a former Mastro associate, appears on the list shilling several auction lots. One source familiar with the Mastro case suggested that Knoll’s shill bidding may have given the government extra leverage against him to make him wear the wire that picked up Mastro’s admission that he had, in fact, fraudulently trimmed the now infamous Gretzky-McNall T206 Honus Wagner card. -Rob Lifson was scheduled to appear as a witness for the government in the Mastro trial before plea deals were accepted by all of the indicted parties. It is well known within the hobby that Lifson ratted-out his former partner, Bill Mastro and avoided prosecution for his own alleged involvement in illegal activities (including fraudulently advertising and promoting the condition of the Wagner card) while working as an executive at MastroNet. 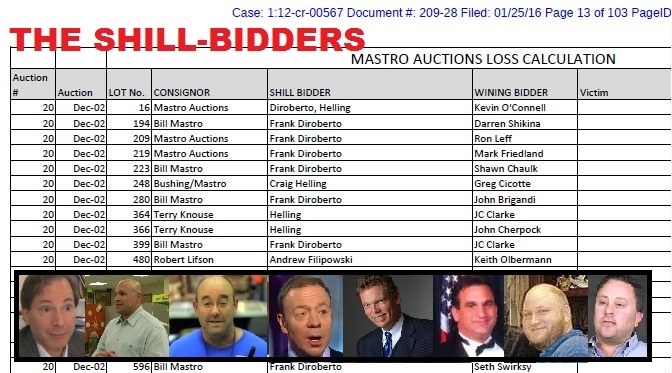 The shill bidding list also revealed that Lifson purchased one of the shilled items consigned by his partner Bill Mastro in the 2002 auction. Lifson paid $1,321.35 for a 1910 “Won In The Ninth” pinback button which was shill bid by “Frank DiRoberto.” Lifson is not listed as a victim by the government on that lot. -Keith Olbermann was listed as the victim and buyer of Lifson’s consigned lot and appears to have been victimized on several other Mastro purchases. Also appearing as a buyer and victim on several lots was director Penny Marshall and New York Yankees owner Hal Steinbrenner who lost over $30,000 bidding on baseball card sets. -Net54 moderator, Leon Luckey, appears on the list as a victim but several sources have disputed his “victim” status. One source who is familiar with the Mastro case told us that Luckey, a convicted felon and former drug dealer, was a serial shill-bidder in sales that Mastro destroyed the bidding records for. As for the items on the released list, Luckey bought shilled lots that were consigned by Net54 member JC Clarke. Another source told us he believes Luckey was involved in Clarke’s shill-bid scheme and said, “The government determined him to be a victim because someone bid before his last bid. Nothing more. However the fact that the only lots he won were Clarke lots — combined with his almost delusional protection of Clarke, one of the worst fraudsters the hobby has ever seen, seems to lead to the unmistakable conclusion that he was buying the lots back for JC.” Our readers will also recall that Luckey and Clarke have something else in common: they both attempted to sell 1869 Peck and Snyder trade cards that were stolen from the NYPLs Spalding Collection. The FBI thwarted both sales. Other Net54 members who were implicated on the list include attorney Peter Spaeth, Ron Goldberg, Greg Schwartz, Peter Garcia and Frank Foremny. Net54 members have been tough on Spaeth but as one former 54 member told us, “Oddly enough there seems to be a code of silence on calling JC Clarke on the carpet.” That’s probably because Luckey has banned most every member who has pointed out his hobby indiscretions. -Zach Rullo, another Collectors Universe employee who works as a PSA/DNA authenticator with Steve Grad was also exposed for shilling lots in the Mastro sales. Rullo and Grad were close with Bill Mastro who was instrumental in giving both of them their start in the authentication business with Mastro Auctions and PSA. -Dave Forman, the President of SGC is also identified on the list as having multiple lots shilled by his brother. Back in 2010, Forman filed a counterclaim against Mastro alleging that the auction house shill-bid items and used his account to place unauthorized bids. President Obama sits in the bus alleged to be the actual vehicle Rosa Parks launched the civil rights movement from. Convicted felon Bill Mastro and Rob Lifson sold the bus to the Henry Ford Museum for $492,000 but its authenticity has been challenged. To the right is the cover of author Ron Keurajian's new book, "Collecting Historical Autographs." -Goldin Auctions owner Ken Goldin is implicated on the list along with Daryl Abromowitz for shilling multiple lots in the Mastro sales as is Heritage Auctions employee Peter Calderone who was a Mastro employee at the time he shilled auction lots. It is interesting to note that many of the illegal shilling techniques administered at Mastro auctions in Illinois are currently utilized by Heritage legally in Texas. Another Heritage employee included on the list as a shill bidder was Nicholas Dawes who also appears on the PBS TV show Antiques Roadshow as an appraiser. Other veteran auctioneers and dealers identified on the list include Ron Oser, Jerry Zuckerman, Andy Imperato and Irv Lerner. -Rob Lifson announced last week that he is retiring from the auction business and allegedly selling REA to his employee Brian Dwyer. In a statement released on the REA blog Lifson said one thing that caught our eye: “I am just retiring from auctions, not dying! My health is great and I am fortunate to have been very successful financially for many decades. I still enjoy the field very much and may actually expand my involvement in some ways, as well as become more involved with other types of collectibles (I have a special interest in political and civil rights collectibles, among other areas, for example).” Lifson’s interest in Civil Rights collectibles is notable in that when Lifson was partners with Bill Mastro he claimed to have discovered the actual bus that made civil rights pioneer Rosa Parks famous. That bus was authenticated and offered by MastroNet in 2002 and purchased by the Henry Ford Museum for $492,000. Independent investigations conducted by Hauls of Shame, however, have indicated that there was no credible evidence to support such a claim by Lifson and Mastro who are believed to have committed outright fraud in representing the bus was the vehicle that Parks refused to give up her seat on. In addition, several sources have told Hauls of Shame they believe that both the Smithsonian and the Henry Ford Museum were shill bid when competing for the bus in the MastroNet auction. Lifson, however, did not report Mastro’s shill bidding to the FBI in that instance. With the shilling so rampant at MastroNet, as evidenced in the government document, it is very likely that the auction house victimized the two deep-pocketed institutions. As Lifson allegedly retires from the auction business he leaves a legacy as the auctioneer who has sold the most bogus baseball material in auction history and is the only auctioneer ever to be caught stealing rare artifacts from a public institution. -Ron Keurajian recently completed a new book for collectors on how to spot forgeries of non-sports and historical autographs. Similar to his excellent book on the signatures of Baseball Hall of Famers, Keurajian lends his expertise to the examination of the signatures of historical figures ranging from Abraham Lincoln to Barak Obama. Collecting Historical Autographs: What To Buy, What To Pay and How To Spot Fakes will be available to collectors this Summer and is being published by McFarland and Co..